Tom Verducci on why the time had come for MLB to make an example out of Chase Utley and why Adrian Beltre is so important to the Rangers. Major League Baseball turned a corner Sunday night. Dodgers breakup artist Chase Utley and his agent, Joel Wolfe, can argue all they want that past reckless slides went without disciplinary action from major league baseball, but Utley's two-game suspension for taking out Mets shortstop Ruben Tejada in NLDS Game 2 on Saturday sets a precedent that was bound to happen eventually. It just happened to hit Utley in the middle of a playoff series. Baseball and its vice president for such on-field matters, Joe Torre, made the rational decision that change had to start somewhere. Admittedly, using the playoffs to enforce a rule that largely has been ignored makes for odd timing, but change never comes easy—Scott Cousins, meet Buster Posey—and the high-profile nature of the Utley slide actually helped make change possible. I imagine old-timers grumbled when rules were changed in 1845 to outlaw “plugging” or “soaking” the runner—getting him out by throwing the baseball at him. I imagine another generation thought players were getting soft when they began to wear batting helmets, or when outfield walls became padded, or flying body-blocks were outlawed or, alas, targeting a defenseless catcher at full speed. The point is that when it comes to the safety of players, the defense of “That’s the way it’s always been done; it’s part of the game” is a hollow one. Baseball must evolve, and as long as it does so with the right intentions by the guardians of the game over player safety, it evolves for the better. So let Utley run his appeal. Let the union be in the position this winter of arguing in favor of endangering the middle infielders among their group, the same players who don’t have the protection that armored catchers do. But baseball has made it clear that the status quo just changed. Major League Baseball will experiment in the upcoming Arizona Fall League with a college-type sliding rule; that is, that the runner actually has to slide to the base, and not to either side of it. Like the pitch clock, that appears to be a move that is much tougher to sell at the major league level. But what already has happened is that the late, reckless slide by Utley is not only officially illegal, but also subject to disciplinary action. That slide technically had been illegal, but it was not clearly spelled out in the rule book. Such slides are handled in more specifics in the official umpire manual, a kind of addendum to the rule book that guides umpires in the interpretation and application of the official rules. The umpire manual essentially borrows from the banishment of the flying body block—the so-called Hal McRae Rule. That rule forbids a player leaving the ground with the express purpose of hitting a fielder. The easy fix for an Utley Rule would be to require a sliding player to hit the ground before hitting the fielder, and spell out such a requirement in the rule book. Baseball is a better game because of the rule that protects catchers from collisions. And if the spirit of that rule is applied to middle infielders—if baseball is guided by doing right by players’ health and excising recklessness—then Sunday was as good a day for change as any. Will Adrian Beltre play today for the Rangers in ALDS Game 4? 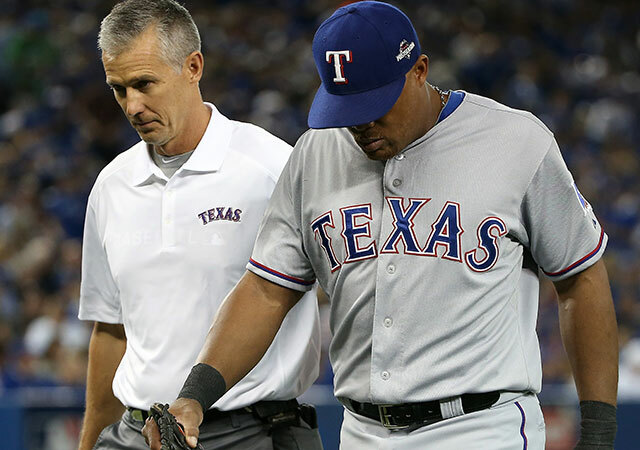 Beltre was feeling better Sunday, three days after he injured his back on an awkward slide in Game 1 in Toronto. But if he does play, the guy Texas manager Jeff Banister calls “the toughest player I’ve ever been around” figures to be compromised. Banister told a revealing story that captures Belte’s grit. After the slide in Game 1, Beltre told Banister how much he was hurting, but he wanted to stay in the game. ​Instead, limited to one decent swing, Beltre lashed an RBI single. After the half inning, in obvious pain, Beltre still had to be convinced by teammates Elvis Andrus and Rougned Odor to leave the game. Beltre, at age 36, already is a physical marvel on a Hall of Fame track. He is 233 hits short of 3,000. He has been much better in his 30s (.306/.353/.505) than he was in his 20s (.273/.328/.462). Just how many 36-year-old third basemen drive in 83 runs, anyway? The answer might surprise you: Only 10 have ever done so. The Rangers could still win the ALDS if Beltre can’t go, but it will be much more difficult without his bat, his glove and his presence. You can see the attention paid to these “micro-calls”—the replay on Odor in Game 2 is one example, though that call was upheld—in the breakdown of all reviews in the regular season. The percentage of replays caused by a dispute over a tag rose from 33.7 to 40.8. You might think such hair-splitting is against the spirit of baseball—that a runner who clearly arrived in time should not be called out if his cleat disengaged from the bag by a millimeter—but with replay and technology, there is no other way to apply the rule of law than fully. Safe is safe and out is out; it’s a binary world with super slo-mo and high definition. There’s no going back to the days of 2009, when umpire Marty Foster called Derek Jeter out during a game that July simply because the ball beat him to the base; an actual tag was not required. As for the managers, they were slightly better in 2015 than in '14 when it comes to their challenges, improving their overturned rate from 47.7% to 49.3. The manager with the highest success rate was Joe Girardi of the Yankees (72.4), followed by Lloyd McClendon of Seattle (71.1) and Chip Hale of Arizona (65.7). The worst? Kevin Cash of Tampa Bay (30.9), Banister (31.3) and Matt Williams of Washington (37.9).